Sometimes a simple act of sportsmanship can create real heroes on the field. In April, during the second inning of a Division II college softball game in the Pacific Northwest, Western Oregon University senior outfielder Sara Tucholsky hit the first home run of her life, a three-run blast that broke a scoreless tie with Central Washington. But as an elated Tucholsky rounded first base, she missed the bag. When she turned around to touch the base, Tucholsky's knee gave out. In a freak accident, Tucholsky tore her ACL; she fell to the ground, and couldn't move. If Tucholsky's teammates carried her around the bases, she'd be called out  an active runner cannot receive assistance from her own team. An umpire mistakenly ruled that if Western Oregon inserted a pinch runner, she would have to stay at first base, turning Tucholsky's surprise three-run blast into a mere two-run single (in fact, the NCAA rulebook says a pinch runner could have completed Tucholsky's home run trot). 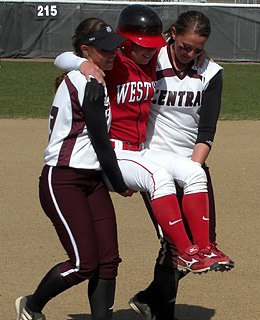 Then, Central Washington's Mallory Holtman, who was playing first base, spoke up. The senior offered to carry her opponent around the bases so that the home run would count; a player has every right to aid the opposition, an all too rare occurence in competitive sports. Holtman and shortstop Liz Wallace lifted Tucholsky and completed the inspiring home run trot. Western Oregon won the game, 4-2, knocking Central Washington out of playoff contention, and went on to win the conference title.